Today, many corporations are using SaaS applications. Leveraging the cloud can be a better option from both a cost and maintenance standpoint. This post is not about the pros and cons of SaaS, but rather about hybrid identity. Maintaining a common user for on-premise and cloud-based application access is known as hybrid identity. An organization wants its employees to use the same credentials when accessing both on-premise and cloud-based applications. With Active Directory (AD) as their standard authentication method for those applications, its IT team choses Microsoft Azure as their cloud vendor. To use the same credentials across applications, the on-premise AD must sync up with the Azure AD. This is done with Azure AD Connect. With an Azure subscription and Azure AD configured, Azure AD Connect is installed on-premise and connects to both the on-premise AD and the Azure AD. It is configured to sync one way (on-premise to Azure) or two-way. 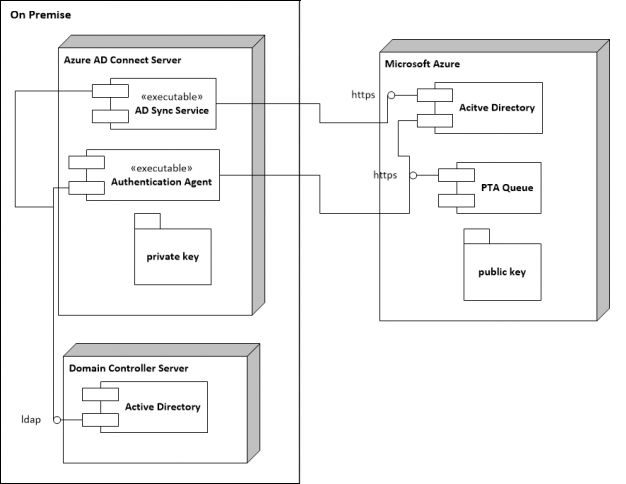 The AD Sync Service in AD Connect will keep Azure AD in sync with the on-premise AD. A built-in scheduler controls the frequency of these syncs. Azure AD Password Hash Synchronization In this option, AD domain data and the on-premise password hash are uploaded to Azure AD. Cloud-based applications can then authenticate with Azure AD, and on-premise applications can continue to be authenticated using the local AD. Azure Active Directory Passthrough Authentication In this option, passwords are not synced to Azure. When a user attempts to sign into a cloud-based application, Azure encrypts the entered password with a public key, and places the username and encrypted password in an Azure queue. 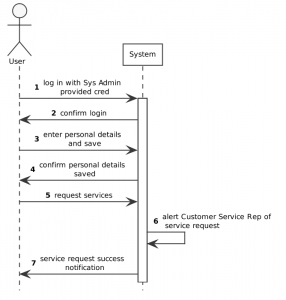 The on-premise Authentication Agent listens to the queue and receives the queued credentials. It decrypts the password with a private key and validates the credentials against the on-premise AD. It then responds to Azure AD with the results. This option is best when there are security rules or concerns with storing the password off-premise. Upcoming: I’ll discuss more complex methods to implement hybrid identity — federation and seamless single-sign-on using Azure AD and on-premise AD. Virtual machines (VM) and containers are similar in concept, but very different in their implementation and use. 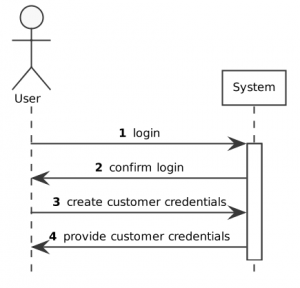 Conceptually, both allow the running of multiple services on a single platform. Both are quicker and less expensive to deploy than physical servers. And, horizontal scaling is easier since there is no need to spin up and configure new physical infrastructure. That’s where the similarities end. Virtual machines are akin to software implementations of physical servers, thus virtualizing hardware servers. Many virtual machine instances can run on one physical machine. This is accomplished by a hypervisor. A hypervisor application creates and maintains the virtual machines. Each VM is allocated CPU, memory, and storage. Each VM also has its own operating system, the Guest OS. VMs with different operating systems can run side by side. Applications that run on a virtual machine don’t see a difference between a VM and a physical server. Containers are run in native OS processes that share the same kernel. These containerized applications package all the required components together, which allows them to be deployed quickly in different environments. My recent Containers blog post goes into more detail on what these are. Notice that the container instances all share the underlying Host OS. Let’s examine the above comparison traits. Startup Time is much quicker with containers, mostly due to the virtual machine having its own operating system. The OS is virtualized for containers. Virtual machines have their own allocated OS and virtualize their underlying hardware. Thus, VMs can run on a server that has different Guest OS types. 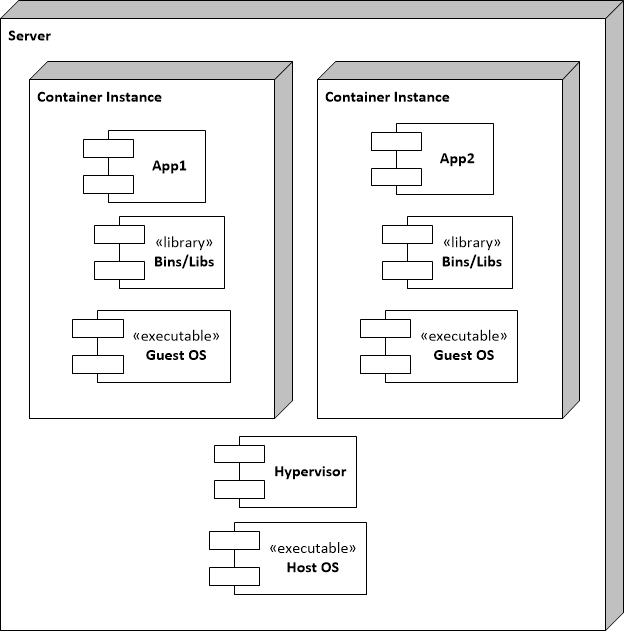 Virtualization for a container is a type of operating-system-level virtualization. This is because a program running inside a container does not have access to the underlying operating system. It only has access to what has been allocated to the container. VM is considered hardware virtualization since, looking in from the outside, a VM appears to be a physical server with it’s own CPU, memory and disk. The memory footprint is smaller for containers. This means a physical server can run more containers than virtual machines. Cost would normally be less when using containers. One reason is that a container does not require its own Guest OS, and thus, many more containers can run on a host server than on VMs. In the end, there are good reasons to use containers and VMs. Both can be supported on-premise or through a cloud-hosting option, such as Amazon, Google, Microsoft, IBM, and others. Both have their uses and related costs. And architects can help inform the appropriate choice. Containers are becoming mainstream as companies aim to cut costs and increase performance. And, with increased use of PaaS (Platform as a Service) offered by vendors such as Microsoft, Amazon and Google, organizations take advantage of built-in support for containers. Containers are a method of operating system virtualization that provides the ability to run an application in resource-isolated processes. Containers can help package an application’s code, configurations, and dependencies into easy-to-use building blocks that deliver environmental consistency, operational efficiency, developer productivity, and version control. Containers help ensure that applications deploy quickly, reliably, and consistently regardless of deployment environment. Containers provide more granular control over resources, and thus improve infrastructure efficiency. The container engine manages the container instances (eg, the starts and stops). Container images are read-only template files that describe what the container’s running application will look and act like along with the dependencies such as required libraries and binaries. 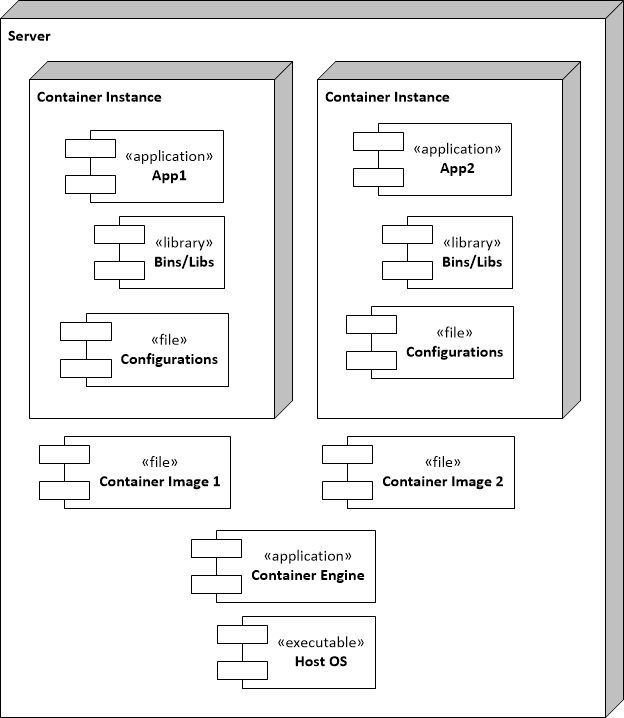 The container engine uses these image files to create the container instance. Migrating to containers is not for everyone nor for every scenario. Some legacy applications are not easily migrated, and it might makes sense to only move new applications to containers. Docker and Google Kubernetes are currently two popular container management products. And, if you don’t want to do an on-premise install of the container engine and associated applications, excellent cloud-based container options are available with Microsoft Azure and Amazon AWS. I’ve only scratched the surface on what containers are. Many tutorials are available; and as with many technologies, you can experiment on your own by either downloading container software or getting a free account on Azure or AWS. In my next blog post, I’ll describe the differences between containers and virtual machines — it can get confusing since there are similarities.